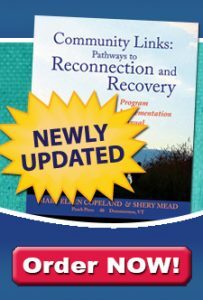 The Vermont Blue print for Health and the Department of Mental Health, in collaboration with the Vermont Center for Independent Living and Vermont Psychiatric Survivors, are sponsoring a series of training events to increase the number of Vermonter’s trained as Wellness Recovery Action Planning (WRAP) facilitators. These training events include WRAP Facilitator Training and WRAP Facilitator Refresher Training, as well as follow-up coaching and mentoring for WRAP facilitators who are teaching for the first time. The Vermont Blueprint for Health is a state‐led initiative that transforms the way that health care and overall health services are delivered in Vermont. The goal of the Blueprint is to provide the community with a continuum of seamless, effective, and preventive health services, while reducing medical costs, and to provide Vermonters who have chronic conditions with the information, tools, and support they need to successfully manage their health. This is accomplished through what the Blueprint is calling “advanced primary care” that seamlessly coordinates a broad range of health and human services for patients and their families. In an effort to provide more support for primary care patients experiencing depression, anxiety and other mental health conditions, the Mt. Ascutney Health Service Area, with Jane Winterling, piloted WRAP in 2010. Their initial efforts were supported by private foundation funding. In 2012 Blueprint supported their activities as part of Vermont’s menu of community based Self-Management programs. The workshops’ popularity was evident in their consistent over-enrollment. During the past year, 27 people were served in 4 (3 adult and one teen version) workshops. Based on Mt. Ascutney’s success, the Blueprint initiated plans to spread WRAP throughout the rest of the state. Working closely with the Department of Mental Health, Vermont Psychiatric Survivors, the Copeland Center, and Mt. 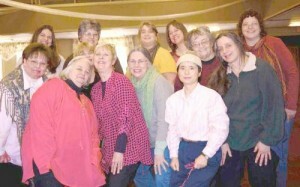 Ascutney Hospital and Health Center, it is estimated that a total of 20 WRAP workshops will be available in 13 Health Service areas in 2013. The Copeland Center is providing WRAP Facilitator Training and Refresher training to make sure there are enough WRAP Facilitators with up to date skills to provide quality facilitators for those groups. This is the latest group of “refreshed” facilitators after their training in Barre, VT.
WRAP Facilitation is a training program developed and implemented by the Copeland Center for Wellness & Recovery (http://copelandcenter.com/) based on ongoing consultation with Mary Ellen Copeland, her associates, Mental Health Recovery and WRAP facilitators, and people with a lived experience in recovery. In order to improve skills and stay informed regarding effective approaches to WRAP Facilitation, continued learning is imperative. It is recommended that WRAP Facilitators attend a Refresher Course at least once every two years in order to stay up to date on developments and best practices.